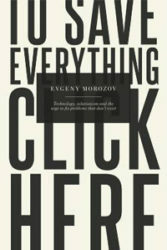 Evgeny Morozov’s new book, To Save Everything, Click Here, is bound to divide opinions. To some he will appear as an over-moralizing killjoy. For others he will represent a beacon against the tides of an all-devouring techno-utopian ideology. Whatever side we choose to be on, we will have to reckon with the likelihood that his book will set the agenda for many near-future studies of technology’s political, cultural and existential significance and impact. Morozov sets out to debunk two ideas which, he claims, are distorting our understanding of technology and which, moreover, are steadily penetrating our whole worldview. The first is ‘solutionism’. It relates to the well-known notion of the ‘technological fix’, but seems to have wider implications. Simply put, solutionism perceives the world in terms of problems that should be solved. And it presumes that they can be solved, more precisely, by way of technological intervention. It is an assumption widely spread, according to Morozov, throughout the world of ICT business, and easily spotted within discourses developed by CEOs of Internet companies and other leaders within the field, but also by theorists. ‘Solutionists’ tend to view phenomena such as politics, social interaction, health or poverty as temporary ailments only: imperfections soon to be overcome by applying the right method. This is where solutionism transcends the concept of the ‘mere’ technological fix: it does not just suppose that every problem should and will find a solution of technological nature, it casts all human tribulations as problems in need of a fitting solution. Both ideas, Morozov argues, are faulty. Internet-centrism cannot be grounded in empirical reality. There’s no such thing as ‘the Internet’, a technological complex which is meant to have either beneficial or detrimental but in any case unidirectional effects on society. In reality, technologies are fraught with ambivalence. The techno-enthusiasm wielded by Internet-centrists roots in a way of thinking Morozov calls ‘epochalism’, which he finds to be equally off the mark: the presumption that certain technologies inaugurate new eras or epochs, such as the ‘information age’ or the ‘digital era’. In fact, there is more continuity in history than the heralds of so many ‘revolutions’ like to think. Solutionism, in turn, is wrong because it imposes a monomaniacal conception of what humanity and human life are and ought to be. It forces upon us a world view that deems all imperfection an evil to be eradicated, a wound to be healed. Hypocrisy in politics, the purportedly stifling character of gatekeepers in technology design and in journalism, the frailty of our biological memory… Solutionism believes that all of these drawbacks could be banned from our existence if we only apply the correct technological measures. Yet, Morozov claims, these phenomena we frame as problems and try to eliminate once and for all should actually be recognized as blessings which contribute in wholly constructive ways to our human well-being and societal organization. What follows turns out to be a sweeping tale about morality and the human condition. Against the growing tendency to outsource moral conduct and decisions to various devices and technological systems – for example via the illustrious design concept of ‘nudges’ – Morozov makes a plea for individual moral responsibility. The argument may at times seem to suggest a sort of conservatism in the political sense. But that is just an impression. Morozov does not seek to replace solutionism with some meritocratic, neo-capitalist concept of personal responsibility. Several cases in his book clearly illustrate this, for instance that of self-tracking technologies. Their use, in Morozov’s view, implies a worldview in which health – specifically weight loss – becomes totally and exclusively a matter of personal behavior. Factors of wider societal, economic and political relevance are not taken into account, e.g. the organization of the food industry, the role of advertising and marketing, economic interests, et cetera. By contrast, Morozov argues, taking up individual moral responsibility for one’s doings precisely and paradoxically requires an intense involvement with those systemic elements. This is ironic. The solutionist, Internet-centrist agenda, bent on blocking out imperfection and expecting all salvation from technological solutions, offloads moral responsibility onto technological systems, but in the process limits our understanding of those very systems. We become morally exempted, but existentially caught up in a conundrum: if we fail, it must be ‘our’ fault. Whereas, conversely, if we refuse to be morally exempted, we will have a clearer ‘view’ in an existential sense: we then realize how our lives are wrapped up in broader constellations of social, economic and political nature. This, then, may be the central insight that we should take away from Morozov’s book. It is a beautiful mixture of good and bad news. The former standpoint presupposes an unattainable ideal of societal perfection, but makes life unbearable for those who cannot keep up. The latter viewpoint accepts and embraces all the ills that solutionism wants to exterminate, and requires us to do considerably more work, but eases the existential strain put on all of us. Which of these two perspectives should we prefer? Morozov might not convince many of the authors whose views he criticizes, but his meticulous and well-grounded argument certainly provides those inclined towards the latter standpoint with crucial extra ammunition. We could remark, on a seemingly more critical note, that several arguments similar or closely related to Morozov’s have been put forward in the recent past within the domain of the contemporary philosophy of technology, and that he does not explicitly or extensively engage with this tradition. For instance, given his numerous references to Bruno Latour, it might come as a surprise that he does not consult the work of technology philosopher Andrew Feenberg, who, in building on concepts from critical theory, Science and Technology Studies and Actor-Network Theory, has formulated a substantial critique of technical rationality under the flag of the ‘critical theory of technology’. In Feenberg’s view, technologies serve to consolidate the power of the ruling elite, but they do this in implicit, even invisible ways, namely, while appearing to be all about efficiency and nothing else, whereas in fact they harbor other than technical, i.e. social values just as much. Also, Morozov’s rather implicit discussion of morality finds more explicit precursors in the work of, amongst others, Peter-Paul Verbeek, who sees – following Latour – technologies as having a moral dimension, but who also elaborately investigates this issue in the light of its philosophical-anthropological and ontological foundations, and of the intellectual history surrounding these. Every view of morality, according to such a broader, more philosophical approach, eventually traces back to certain ontological presuppositions: what is ‘man’, what is ‘being human’? A more specific involvement with these philosophical debates might have led Morozov to a somewhat more nuanced perspective on what, on the one hand, technology and, on the other, ‘man’ are – and perhaps in that way also to a less hostile treatment of his many intellectual enemies, such as Kevin Kelly. Recent contemporary philosophy of technology suggests the dividing line between man and technology to be very evasive, if not outright impossible to trace. In this view, humans are technological by nature and technologies are intrinsically ‘human’. Morozov does appear to treat technology as a basic human endeavor, and there is nothing wrong in his opinion with technology per se – on the contrary, his arrows are aimed first and foremost at certain theories about technology, i.e. solutionism and Internet-centrism. But the question remains whether solutionism and Internet-centrism are not principally ingrained in our human condition. And whether we are even able to not be solutionists – in an ontological sense, to be sure. Morozov’s approach, it seems, cannot preclude this issue. Nevertheless, this should, in the end, not affect our appreciation of his study (and in any case no single author can ever grapple with all literature available). Morozov’s roaring line-up of timely, well-documented cases and his masterfully delivered ethical-existential plea give us plenty of food for thought. Even if they do not ‘solve’ all ‘problems’. Indeed, we shouldn’t want to save – or salvage – everything.